: Although the term Toast immediately brings to mind a simple breakfast of toasted bread topped with a little butter and jam or honey, this category is actually a much larger and super exciting one! 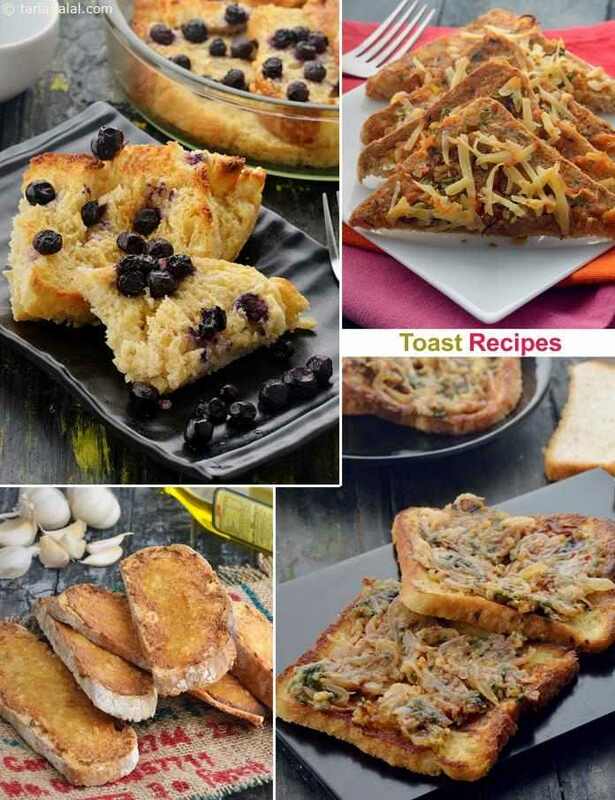 Options range from the sumptuous Beans On Toast and the aromatic Caraway Seed Toast to the dainty Mixed Sprouts Open Toast, the spicy Cheese Chilli Toast , and the kid-friendly Apple and Cheese Toasts. Toasts can also be made in a handy mini format, to be served as starters at parties. Grilled vegetable toast, a delectable crunchy toast pepped up with cheese and vegetables, giving a creamy flavour to the toast. Cubes of tomato and cottage cheese marinated in herb oil and topped on crusty french bread. Quick as a wink to prepare! everyone will enjoy these delicious toast!